This guide explains how to create a Playstation and PC disability standard switch interface. 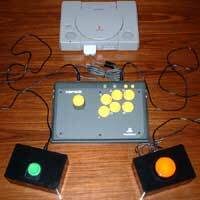 This controller will also work with old style Playstation 2 consoles to play Playstation One games and DVDs. If you're an absolute beginner, we strongly recommend that you follow "The Basic Soldering Guide" - by Alan Winstanley. 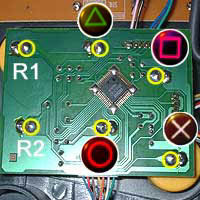 Then have a look at the "How Stuff Works" explanation of game controllers. 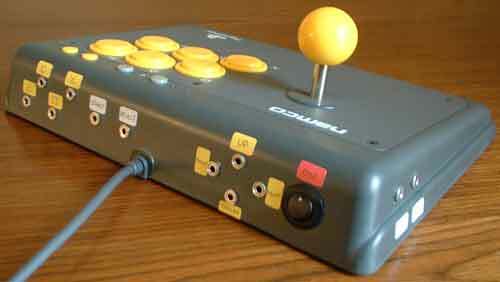 Most of the components used are commonly available from Electronics stores such as Maplin Electronics, apart from the Arcade Stick itself. The NAMCO Arcade Stick is out of production, but many other brands of Playstation Arcade Stick will do. Try your local games shop, and Ebay to start with. Be warned that not all Arcade Sticks have room for 14 switch sockets, and not all are as easy to solder sockets to. Connecting to a PC: You will need a 'PS to PC USB' adaptor, which are cheap and commonly available on the internet. Try www.Divineo.com, www.Play.com or Google. I also recommend downloading the free JoyToKey software to enable very versatile control of PC Mouse and Keyboard functions using this D.I.Y. switch interface. MAME (Multiple Arcade Machine Emulator): Play real Arcade Games (1972 to date) on your PC using switches. Please get in touch for more help. 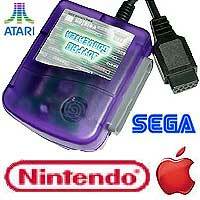 Connecting to other Games Consoles: With the right adapter, this Playstation controller can be used with Sega Megadrive, Sega Saturn, Nintendo NES, SNES, SNK Neo Geo, MB Vectrex and other games machines. Retro heaven! 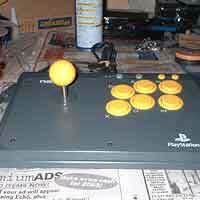 Buy pre-adapted: You can buy ready to go adapted Namco Arcade Sticks from the OneSwitch shop. Soldering iron (15 to 30 Watt power); thin solder; soldering flux; desoldering braid; thin wire (e.g 10 strand 0.1mm or 7 strand 0.2mm). Patience. These typically take me at least 6 hours to complete. Drill 14 x 1/4" holes for the 3.5mm sockets, ensuring that there is room free to fit them. Use the main picture above as a guide 10 at the back, 2 on the left side and 2 on the right side. 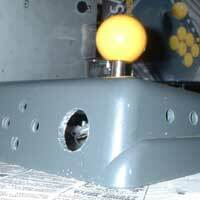 Drill 1x hole large enough to house your on/off switch (20mm hole pictured). Connect a ground loom (here in black wire). 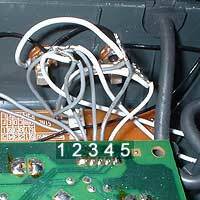 You need to link all 14 sockets together in a continuous chain, using the SAME solder contact on each socket - ideally the rear left. Leave a long trailing wire from both ends of the chain, soldering these to one connector on the on/off switch. 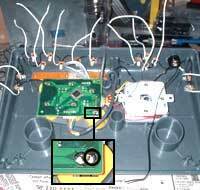 From the other on/off switch connector, solder a wire or two to Ground points on the PCB (example point encircled in black). Soldering directly onto any PCB (Printed Circuit Board) needs to be precise and quick to avoid damaging delicate circuitry. Blow on the chip immediately afterwards for good luck! Expose the corresponding wire, and connect to the appropriate socket. Ensure that the connection from the large PCB to the small thin PCB remains. Insulate the bare wires with electrical tape. Expose the corresponding wire, and connect the appropriate socket to it. 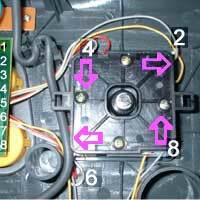 Ensure that the connections from the large PCB to the joystick remain. Find a game that you can test all 14 sockets on, as well as the on/off switch to control use of the remote switches. Any problems - disconnect, and restudy the quality of your soldering. 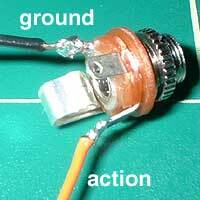 Use the soldering iron and desoldering braid to remove, then resolder any poor joints. 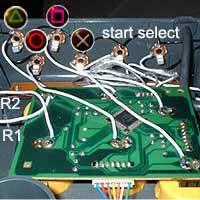 Using various Playstation adapters you can connect this switch interface to many other games machines and computers.